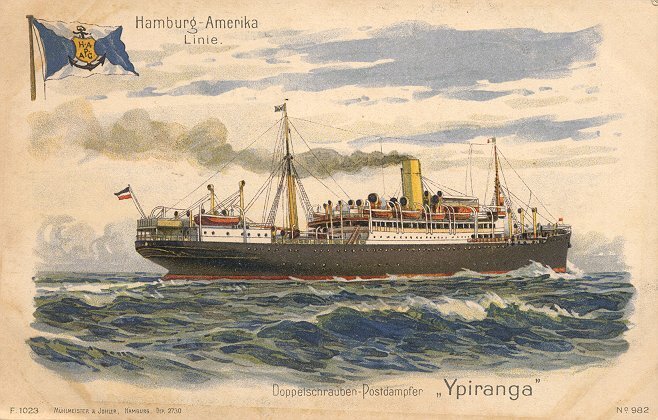 Ypiranga was built for the Hamburg-America Line by Krupp's Germaniawerft, at Kiel. Launched in May 1908, she made her maiden voyage, on Hapag's Hamburg-Brazil route, on 14 October of the same year. Over the next three years, she served on Hapag's Hamburg-Mexico and Hamburg-South America routes and, on one occasion, sailed from Hamburg to Philadelphia. After spending the war years idle at Hamburg, Ypiranga was ceded to Great Britain as a war reparation. She was then placed under White Star Line management in April 1919, and was used as a troop repatriation vessel and as an auxiliary ship on White Star's service to Australia. 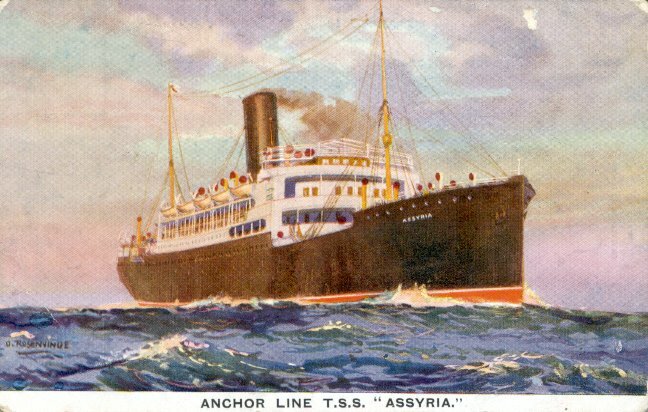 After being laid up at Hull in 1920, Ypiranga was sold to the Anchor Line, which renamed her Assyria. She made her first voyage for Anchor in January 1921, from Liverpool to Bombay, the route for which Anchor acquired her. In June of that year, however, she was placed on Anchor's Glasgow-New York service, where she remained until August 1925. She then returned to the Bombay service, and was also used for cruising. Assyria was sold again in 1929, to the Companhia Colonial de Navegacao, a Portuguese concern, which renamed her Colonial and placed her on their Lisbon-Angola-Mozambique service. Sold to the British Iron and Steel Co. for scrapping in 1950, the ship (renamed Bisco 9 by the shipbreaker), was wrecked near Campbeltown in September and was broken up where she lay. Sources: Bonsor's North Atlantic Seaway; Bonsor's South Atlantic Seaway; Haws' Merchant Fleets.